I know there used to be an option in a past version, I feel like I must be missing something obvious. Thanks for any help. Hi, it's not currently in there although we an restore it for a future update, thanks. Any progress on that? It's the only thing keeping me from switching to Emby theater full time. Been having issues with Kodi and would love to make the switch. Edited by stplatt, 29 August 2017 - 10:12 PM. Edited by Doofus, 02 February 2019 - 02:28 PM. @stplatt let us know if this helps. thanks ! Where do I put the mpv.conf file? Also what's the easiest way to get the specific device name? If that is the right location, I guess I have the wrong device name because it is still playing on my default audio device. Edited by stplatt, 07 October 2017 - 06:05 PM. And I'm just learning that Theater is probably switching to a portable config. If that happens, you'll need to put it in that folder. I would like to make Emby/MPV use WASAPI based on the (possibly faulty) presumption that this would support bit-perfect output to my analog soundcard (Essence STX II 7.1) at the file bit depth and sample rate without a need for me to manually re-configure windows sound to match the various audio configurations. What I am not sure is how to use the instructions above to identify the exact name of the audio device to put in the mpv.conf file. Where do I enter audio-device=help to list the audio devices? Where do I enter audio-device=help to list the audio devices? That would be by interacting with the mpv executable on the command line. Thanks, now I just have to figure out if it is actually using WASAPI and using the appropriate bit rate. Hey, @Doofus, is there a way to tell MPV to use WASAPI exclusive mode? I think this would cause the soundcard to play the audio at whatever bitrate the file contained. Edited by lifespeed, 02 February 2019 - 12:07 AM. But if you don't bitstream, mpv will decode the audio, not your audio card. I don't have or want a receiver, I connect the sound card directly to 4 channels of ADCOM GFA5500 amplifier and Martin-Logan Quest Z front speakers - the side speakers are more pedestrian. It would be silly to have this sound card only to send bits out over HDMI. There is nothing wrong with the software decoding DTSHD, etc, I would just like to relieve myself of the drudgery of changing audio bit rates/depths to match the media while sending the unmolested data to the soundcard. Looking at the log file below of Emby playing a rock concert MKV file with 96/24 audio, it does appear as though it is dropping the bit rate down to the Windows-configured 48KHz. 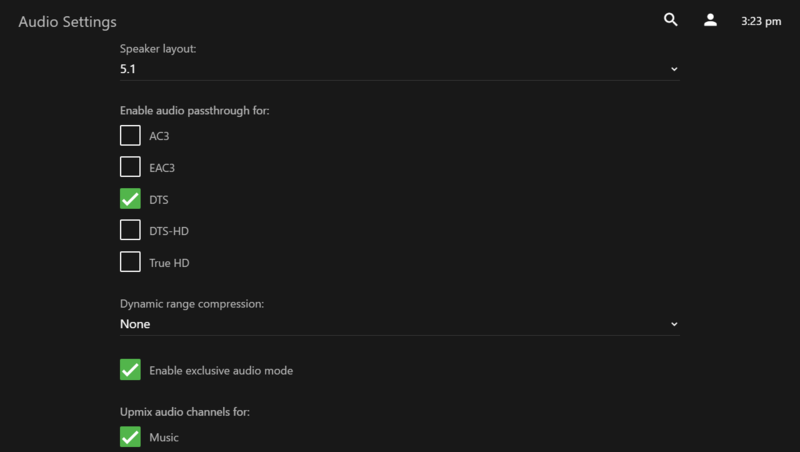 I wish there was some way to get the sound card to accept whatever bit rate is sent. I thought exclusive mode would do this, as it is not required to accept sound from other sources, presumably all at a common bit rate. Can MPV be configured for WASAPI exclusive mode? As always, your expertise in enthusiast-level configuration is appreciated! [   0.655][v][ao/wasapi] IAudioClock::GetFrequency gave a frequency of 1152000. [   0.658][v][ao/wasapi] device buffer: 2400 samples. [   0.658][v][ao/wasapi] using soft-buffer of 9600 samples. Here we see the 96/24 sound is accepted when Windows has been set to that sample rate. Edited by lifespeed, 02 February 2019 - 03:22 AM. But that's what I was trying to say, WASAPI is Windows audio. mpv will decode to whatever Windows audio is configured to. Looking at that log snippet, you're using the numeric ID. Try this. Make that audio card the default. Delete the audio device config from the mpv.conf. Play your video, and post the mpv log. I'll take a look at it. Same results as before, without the WASAPI entry in mpv.conf, it tries 96KHz but sets it to 48KHz instead due to windows config. I think there is a possibility WASAPI exclusive mode will accept the bitrate of the media. But MPV is not using exclusive mode by default. [   0.808][v][ao/wasapi] No device specified. Selecting default. [   0.852][v][ao/wasapi] IAudioClock::GetFrequency gave a frequency of 1152000. [   0.854][v][ao/wasapi] device buffer: 2400 samples. And here we have 44.1/16 CD audio, same result - 48KHz. [   0.579][v][ao/wasapi] No device specified. Selecting default. [   0.677][v][ao/wasapi] IAudioClock::GetFrequency gave a frequency of 1152000. [   0.679][v][ao/wasapi] device buffer: 2400 samples. [   0.679][v][ao/wasapi] using soft-buffer of 9600 samples. Here is the line where it shows it is using shared mode. Which can be discerned simply by playing another audio source while Emby is playing. Both Emby and the other windows audio source can be heard. Edit: Here is a Microsoft article on the subject. Edited by lifespeed, 02 February 2019 - 03:56 AM.